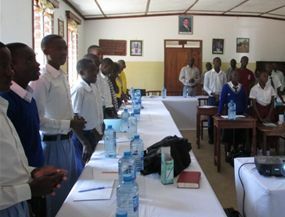 The Education Desk of the Evangelical Lutheran Church in Tanzania (ELCT) recently organized Training of Trainers' seminars on teacher-friendly supervisory methodologies. 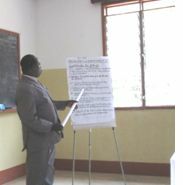 Heads of 10 schools, academic coordinators and school managers attended the two-day seminar held in Nyakato Mwanza in mid November 2012. The total number of participants was 16 and they were expected to impact on more than 4,000 students and 1,000 educationists. One of the inspectors, Mr Eutace Mgawe, (STANDING) in one of his e-mails supporting the seminars, suggested that the capacity building seminars be extended to other inspectors of two districts namely, Sengerema and Kishapu. He said "the seminars will enhance the inspection and make it more meaningful and hence creating a learning atmosphere for both the school teachers and inspectors". Kristine Kaaber Pors, (RIGHT) the Danmission Development Program Consultant based in Arusha, Tanzania, presenting an issue in the Education Rights seminar which involved heads of schools, academic coordinators and students from Kishapu and Sengerema Districts. 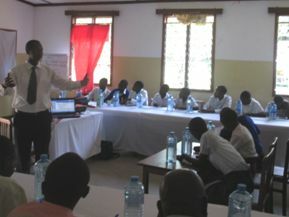 The seminar took place at Nyakato Bible College in Mwanza and the main facilitator was Mr. John Innocent Kisigiro, a lecturer from St. Augustine University, Mwanza. 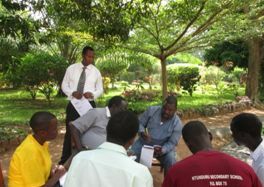 This was part of the implementation of the project: "Education Governance and Management Improvement" in Mwanza/ Shinyanga area. Seminar participants getting ready for an "energizer" at the seminar The facilitator Mr Innocent delivering a lecture. Group work in the seminar (LEFT). 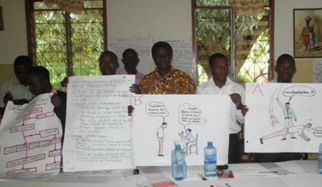 Seminar participants displaying posters advocating for change. 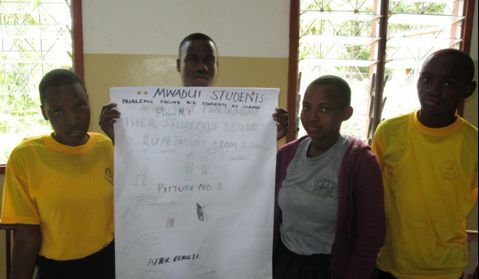 The posters would later be displayed in their respective schools on the school notice-boards. Some of the participants in group discussion during the Danmission Global Partners meeting held at MS TCDC Usa River, Arusha during the 4th week of Nov 2012. The partners were from different parts of the world. The objective of the Usa River seminar, among other things, was to revisit and share experiences from Phase One that included issues related to relevance, implementation, challenges and management of Danmission funded projects. The participants also shared hints on programme reporting, monitoring and enhanced ownership of programme results among Danmission partners. They also got a chance to go on a field trip to learn, get inspiration and instil team building spirit among partners and Danmision staff.